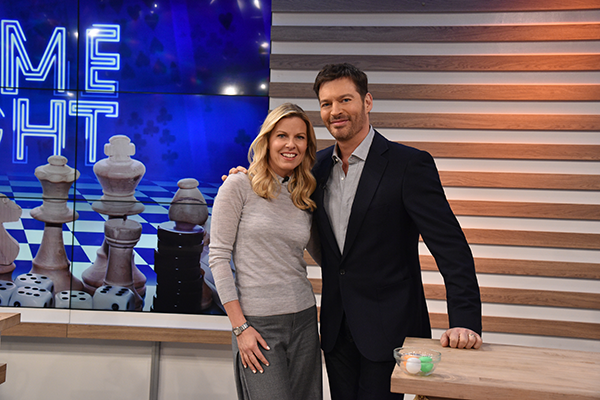 Today my first ever segment on the Harry show aired, and I have to say, it was an absolute BLAST to film. 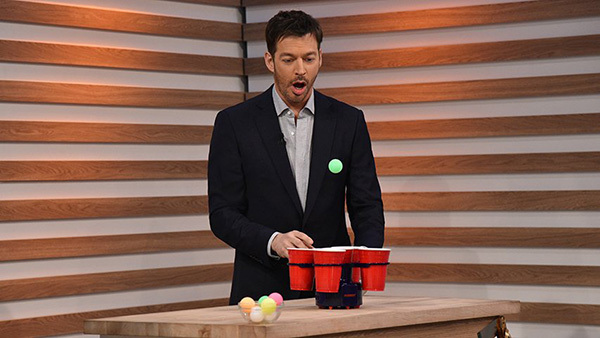 If you told me even a month ago I'd be playing drinking games with Harry Connick Jr I would have laughed REAL hard. But 2018 is turning out to be full of surprises. Utter Nonsense is one of my family's favorite games, but when it's just adults around, we like to break out this version of it. 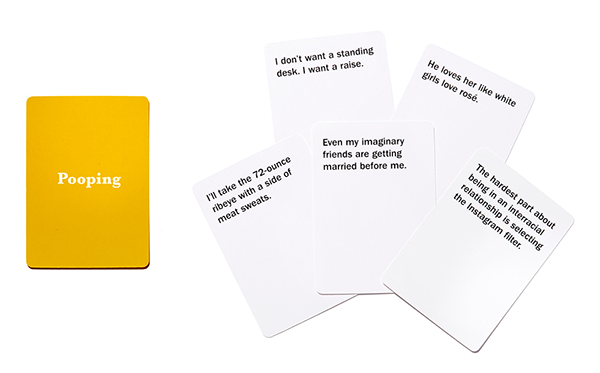 Utter Nonsense: Naughty Edition will have you laughing for hours, with friends old and new. Using silly accents to deliver lines that are just plain ridiculous, even the most shy person in the room will love joining in. Listen, drinking games can be fun even if you're no longer college-age. 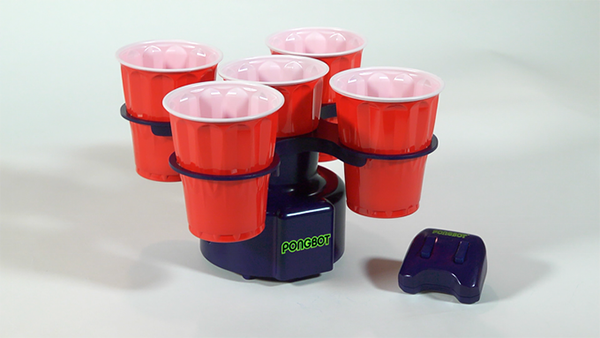 And PongBot has quickly become a favorite for me. Compete individually, or on a team, to throw ping-pong balls into cups held by the little robot. Each round, have someone different man the remote control, or set it to auto-pilot and all compete at once! I love a good popcorn bar because everyone wins. 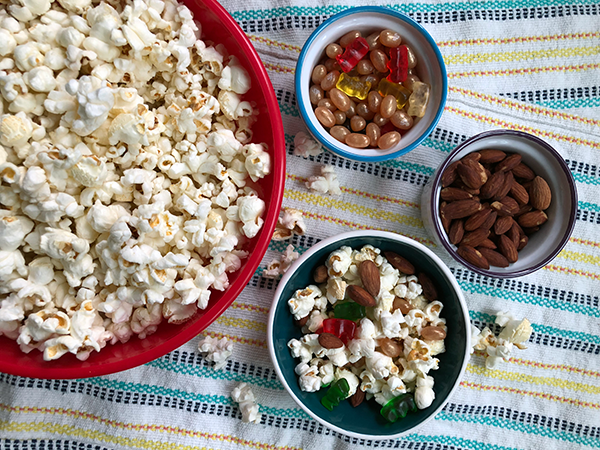 It's an easy set-up and clean-up for the host, and everyone gets to make their own custom snack that's easy to eat in-between turns during whatever game you're playing. An absolute MUST for your popcorn bar is pre-popped popcorn. I love G.H. Cretors because it makes it impossible to fill your home with a burnt-popcorn smell, and their bags of popcorn are just delicious. I recommend grabbing a few bags of their more traditional flavors, like Extra Virgin Olive Oil and The Mix (Caramel Corn and Cheddar Cheese Corn! ), and one kind of crazy flavor like Organic Dill Pickle. Then stock up on mix-ins. We like to have a few bowls of treats like chocolate chips, mini-pretzels, crunchy cereals, nuts, sprinkles, fancy salts, and gummy candies. Any classy adult party has a cheese board, right? Take it up a notch and create a full snack board. I promise this is actually going to feel like less work. Less pressure on making a restaurant-worthy cheese board, and more focus on making a platter full of grab-able treats. Pro-tip, fill your plate or platter to the edge and use some fun snack picks to make things festive. A crowded platter always looks more appetizing than a few bits and pieces scattered around a wood board. Some of the mix-ins from your popcorn bar can work great here as well. Instead of mixing everyone individual cocktails throughout the night, make refills easy with a pre-made mixed drink for the group. This recipe for Sparkling Ginger and Sangria Lemonade is refreshing and simple enough to put your own twist on. All you need to get started is a few ingredients: lemons, white wine, honey, and ginger ale. Keep the punch bowl in the cupboard and instead serve your sangria or other mixed beverage in a tall, clear dispenser. This acrylic drink dispenser has a well for ice in the bottom to keep your mixed drink chilled without watering it down. 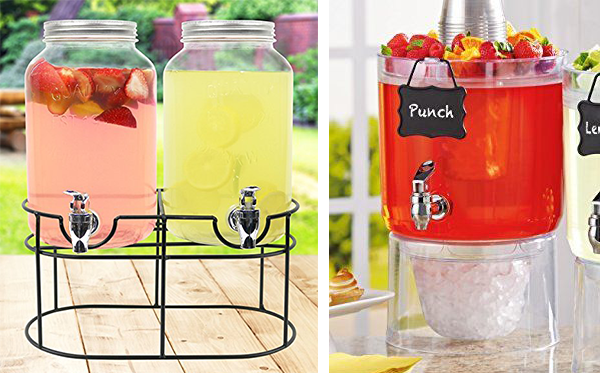 Or if you want to serve a few options, this pack of two glass mason jar drink dispensers is perfect. You don't have to pull out the full party box and go crazy, but having a few decorations can make game night feel extra special. I love these little things that pack a big punch. 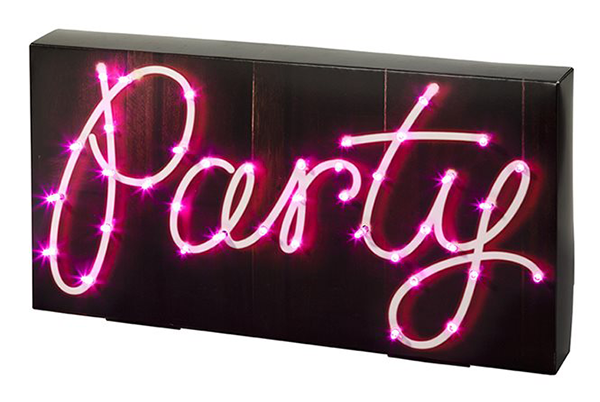 This Neon Party Sign is so fun, and generic enough to use for any occasion. You know I love a good PaperSource find, and these party decorations are my latest obsession. 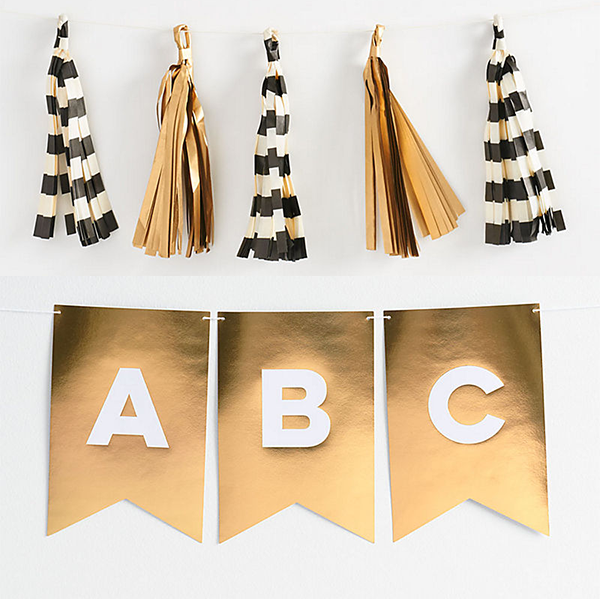 Mix and match these Gold, Black, and White Tassel Banners with a Gold Letter Pennant Banner spelling out a phrase from your favorite game, or something short like "Good Luck". La La Land is definitely starting to feel like home, but there are still some adjustments, and a big part of that is making new friends. Jon and I are hoping to host many adult game nights in our future, and will definitely be using lots of the ideas included in this segment. Have your own twist on grown-up game night? Share on social and make sure to tag me @meredithplays!